left turn | Why you drive bad?! It rained the other night as I left work. I wasn’t expecting it to rain, but I figured it would be fun to play with the Volvo. I didn’t think the tires were that bad, but it seemed like it would break loose every time I got on the gas. It’s amazing how that little 4-cylinder can overpower the traction so easily. I did a few benign fishtailing around some corners as I went home, but nothing too crazy until I got onto the MoPac frontage road. It’s very oddly designed intersection as it’s a T-intersection that goes under MoPac, but as it approaches the southbound frontage road, it curves slightly to the right so making that left turn is roughly a 100 degree change in direction. I usually just cut the corner to keep the racing line so I don’t lose too much speed. Yeah, too much Forza Motorsports or Gran Turismo does that to the brain. 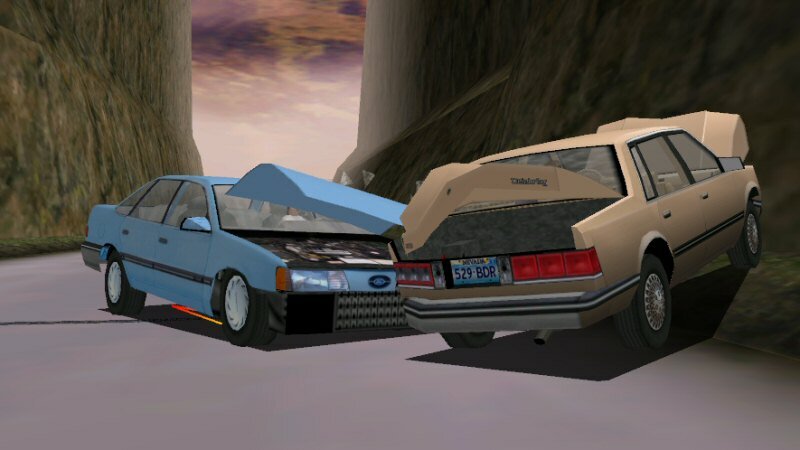 Unfortunately, unlike a video game, driving your car recklessly has much higher consequences. As I approach the turn like I’ve done a hundred times before, I start drifting as I hit the apex of the turn. I think I might have lifted my foot off the throttle and it induced lift-off oversteer causing the rear end to come loose. In a video game, I’d let go of the gas and drift around. This is no video game. Having only owned front-wheel-drive cars since I got my license I’ve learned that punching the gas usually straightens out the car if the rear end comes loose. Bad mistake! I instinctively punch the gas pedal and boy did that make things worse! As soon as I touched the pedal, the whole car just spun like a top! I only remember a blur of the car spinning 360 degrees around like it was on a turntable and coming to a stop facing the wrong way of the one-way frontage road. I was now staring at the grille of the Escalade that was previously behind me. Suffice to say I think everyone in this situation felt a bit awkward. It took me a couple seconds (which felt more like minutes) to realize WTF just happened because it happened so damn fast and unexpectedly. I was also partially in awe that the little Volvo managed to do a stunt like that. I’m surprised that traffic in the other left-turn lane just kept going after seeing a car spin 540 degrees in two lanes of traffic! I’m probably sure that the person driving the Escalade was glad they didn’t get wiped out by a beater Volvo that looks like the many uninsured beaters roaming the city (don’t worry, I’m insured). I definitely drove a little more carefully the rest of the way home! It’s amazing the technological advances in safety that have made cars safer because my other car has traction control and electronic stability control which prevents the car from spinning (it’s also front-wheel-drive so it’s less likely to spin out like this in a turn). On the other hand, because the newer technology shields the driver from danger, he won’t know what the true dangers are out there. I immediately knew the roads were slick when driving the Volvo because it spun the tires fairly easily so I knew I could get into trouble. With my other car I would drive the wet roads as aggressively as I normally do on dry roads because of the safety features. It’s funny how technology makes us safer, but act more foolish because of the hidden dangers. So drivers in the US can’t get used to roundabouts because roundabouts require them to think. Sounds about right. There is a major intersection that I have to deal with every day to and from work. Traffic is always backed up at this intersection. I’ve often wondered if it would be better if this intersection was changed to a roundabout. Then I realized if people can’t figure out how to merge onto the freeway smoothly then how the hell are they going to handle a roundabout. It’s too bad because I love roundabouts given that a highway junction back home was converted from a traffic light to a roundabout almost a decade ago and the congestion was dramatically reduced afterwards. The article made an interesting point about the difference between a traffic circle and a roundabout. In a traffic circle, the traffic going into the circle has the right-of-way and in a roundabout the traffic already in the circle has the right-of-way. I don’t understand why traffic going into the circle would ever have the right of way, but I can see why that method is unpopular. I guess that’s why roundabout are not too commonplace in the US since most traffic circles are in the northeast and there are more people in the northeast to sway the bias. Again, it’s too bad because I think roundabouts are genius traffic controllers (unless we’re taking about a Turbo Roundabout which everyone back home hates and I can’t blame them because it’s such a fustercluck). The other day I was heading back to work and I came across a dude in a Jeep. He was doing 40 MPH in the left lane on a 60 MPH highway. I was coming up behind him doing the speed limit. So I slow down to 40 too because I don’t want to overtake him on the right since I have to make a left turn into work soon. Well, I see this guy get into the left turn lane and I’m thinking he’s going to make a left into the car repair shop next door to my work since he got into the center turn lane real early. So I don’t bother speeding up because I’m going to make a left turn. Well, apparently this guy is turning into the same parking lot as my work so I couldn’t get into the left turn lane. If you’re going to make a left turn, get into the turn lane at the appropriate time! I can’t anticipate that you’re going to overshoot a valid left to make a left farther up the road! Get your brakes checked if you can’t slow down fast enough! You make a left turn in front of me?! Terrible intersection design. Even worse drivers. I had to go drop off a package at FedEx today and some idiot decides to make a left turn in front of me. I had to merge into the left turn lane quickly since it is rather short. I came close to cutting off a police car, but I signaled and had enough distance where it wouldn’t be offensive. Finally the left turn signal turned green and cars were making their left turn. I was entering the intersection and was aiming for the right-most lane when some asswipe in an Exploder rushes up the middle lane and turns left in front of me! I laid on my horn to remind him he’s a retard. The cop that was behind me didn’t even bother getting involved. Dammit, driving is not that hard if you just put down the cell phone and use your brain. I swear, I’m getting more use out of my horn here than I ever did back home. It is getting frustrating as I encounter the same situation every morning this week on my way to work (except I’m not making a left, I’m just mentally shouting about how stupid they are). People think the middle lane is also a turn lane, but it’s a thru lane! You’re not allowed to make a left from that lane! If you overshoot the damn intersection by the time you realize you should have turned left, don’t break convention by doing what you think is a miracle move. Go down the road and turn around like a rational person or at least attempt to get into the turn lane instead of just blind-siding someone! This morning I was behind a Jeep Grand Cherokee, a typical mommy-mobile in suburbia. I was driving in the middle lane and I see her merge into my lane from the right. She drives straight for a little bit while slowing down. The light ahead was green so the move puzzled me. 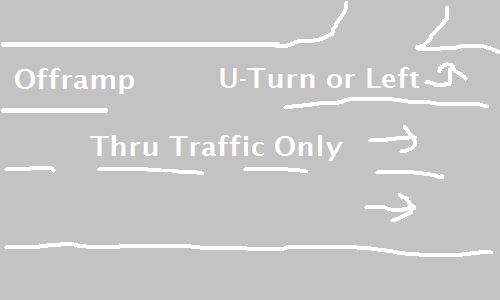 Then she proceeded to get into the left-most lane (which becomes a left turn lane and also has a green light). Now, why would anyone do a move like that? 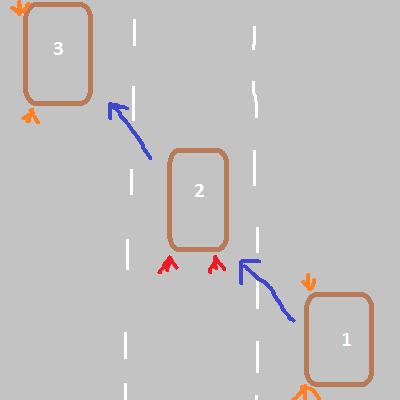 Wouldn’t it be more efficient to merge left twice (or once through two lanes if you’re ballsy), then slow down (optional) instead of merge left, slow down, and merge left again? Seriously, I have to question why merging is such a task for drivers here!